Open are donating the money we usually spend buying festive gifts for our lovely clients to the homeless charity Shelter for their Christmas appeal. Shelter helps over 4 million people every year struggling with bad housing or homelessness through their advice, support and legal services. Their Christmas appeal aims to help the 100,000* children that will be homeless this Christmas. You won’t see them on the streets, but they’re still homeless. Because they don’t have homes, they’re living in places like hostels and B&Bs. As a parent of an (almost) 3 year old boy I can see more than ever that Christmas should be a magical and exciting time – playing games, knocking down decorations and wondering if they’ll see the presents they wished for under the tree. But 100,000 children might not even have room for a tree – let alone space to sit around a table for Christmas dinner. Plus, their temporary accommodation can be hundreds of miles away from family and friends. I hope you agree that the money we would have spent on creating our Christmas mailers has gone to a good cause and hopefully we can still put a smile on your face with something a little more DIY this year to help you get into the festive spirit. 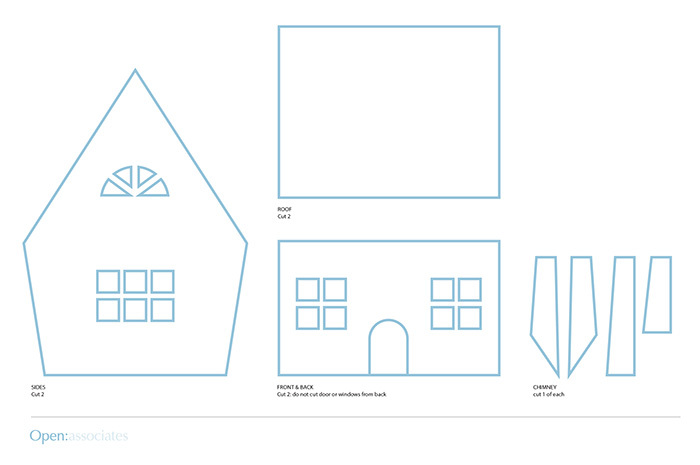 Use our super easy gingerbread house template and recipe below to create your own masterpiece. Oh, and feel free to donate should you wish. Before you start building, you’ll need some gingerbread to work with. Ready to start creating your masterpiece? Snow: melted white chocolate sprinkled with sparkling sugar. Wreaths & Window Boxes: liquorice whips & green peppercorns. Shutters & Lintels: sticks of chewing gum. Red Chimney & Door: dough tinted with food colouring (outline them and house joints with royal icing). Pathway: sunflower seeds, puffed millet, and dragees. Thatched Roof: All-Bran cereal lined with sticks of red gum. Eaves & Masonry: jelly beans. Window Frames: sticks of gum. Mortar: Royal icing is the “glue” that holds the pieces together and the embellishments in place. *Source: government statistics on homelessness from England, Scotland and Wales.